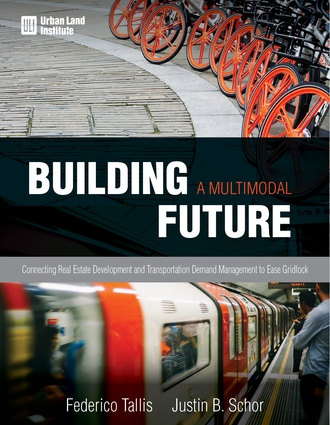 Building a Multimodal Future shows how planning land uses and transportation together with transportation demand management (TDM) policies creates safer, more walkable environments. TDM encourages travellers to maximize use of available transportation systems in the most efficient and effective ways possible, thus balancing the demand for and capacity of current transportation networks. As such, TDM policies catalyze creation of new property-based transportation amenities that allow real estate developments to increase density and better use transportation infrastructure while reducing the impact on traffic congestion and the need to construct expensive structured parking.In this book, authors Schor and Tallis explore the origin, implementation, best practices, and results of TDM policies from 10 distinctive communities across the U.S. Uniquely, it includes the perspectives of those who implement these policies and those who are affected by them, including property owners, developers, managers, and other professionals who work with TDM policies. With these real-world examples, you can learn how to establish TDM policies in your own projects and urban areas to improve your bottom line while creating a sense of community for all. Justin Schor is a principal at Wells + Associates with over two decades of transportation demand management experience in communities throughout the United States. Specializing in developing TDM programs, he has helped plan, start up, and manage sustainable transportation solutions for nonprofit transportation management associations and regional governments as well as private residential, commercial, and institutional developments. Schor is recognized for transportation solutions that demonstrate measurable change in travel behavior. He holds a master of regional planning from the University of Pennsylvania and a bachelor of science in urban and regional studies from Cornell University. He has been a member of the Urban Land Institute since 2017. Tallis is a transportation planner with extensive private-sector consulting experience specializing in transportation demand management, transit planning, and geographic information systems (GIS). He has consulted for major real estate developers, property managers, employers, universities, and hospitals, assisting clients in all things involving transportation from financial planning to parking management. Tallis holds a BA in city and regional planning from Cal Poly, San Luis Obispo and an MS in GIS technology from the University of Southern California.